GRENADE IS A MELBOURNE BASED, INDEPENDENT DESIGN & BRANDING AGENCY. We elevate premium brands to their highest possible outcome, adding something distinctly new to our broad national and international portfolio of work with every new project. Staffed entirely by a senior team, our clients enjoy a hands-on approach from everyone in the studio, while we enjoy long-lasting, close and collaborative relationships with our clients. Ben Buxton is the founder of Grenade and its ongoing managing director. Heir to five generations of Australian property expertise, Ben has real estate and the art of development imprinted on his DNA. Ben has perfected the art of marketing and honed his selling skills in a broad 21 year career. A key part of his success is his careful selection of projects. This ensures that everyone in the studio can embrace each project’s unique creative challenge, and that Grenade remains an inspiring place for our highly motivated people to work. Simon has worked extensively across creative accounts both in Australia and abroad. While in Europe in the early 2000s, Simon successfully developed leading market strategies and creative campaigns for Euro Disney, Manchester United and Sky Television. After returning to Melbourne in 2008, Simon followed in the footsteps of previous Vaughans in the property industry by managing multiple award-winning campaigns for clients such as MAB Corporation, Salta, Glenvill, Grocon, Hamton and red.c. After successfully completing an Advanced Diploma of Business (Advertising) at RMIT, Bianca began her career at a leading creative advertising agency where she was a production and relationship manager for four years. Bianca joined the Grenade team in 2013 as production manager, and has now moved into the client service team. Bianca has brought her skills and streamlined processes to a wide range of projects for clients including NAB, ICG Property, Michael L Yates & Co. and Oxdra. Rob brings 19 years of experience to Grenade, working in a range of leading design studios and agencies. He has a strong background in desktop publishing, corporate branding, web design, brand management and apparel design. As Grenade design director, Rob keeps a sharp eye on all work throughout the studio to ensure that every project, big or small, is of the highest standard. His broad experience means he also brings key management skills and enjoys a truly collaborative process. Rob’s passion for branding is evident in his work, and he is constantly inspired by his clients’ projects to find new ideas and potential for creative thinking. Fired by a passion for all things digital, Liam has worked with some of Australia’s most recognised and emerging brands including Village Roadshow, RACV, GPT Group, Lonely Planet and Henley Homes. Liam is driven by a need to create clear, intuitive and innovative user experiences and he takes pride in finding new ways to tell unique stories in a crowded marketplace. As part of the team at Grenade, Liam delivers tangible, creative results for his clients in the ever-evolving digital landscape. Before joining the team at Grenade, Katie worked across the creative industry in a range of production and administration roles for premium brands including Zagame, L’Oréal, NAB and IFM Investors. 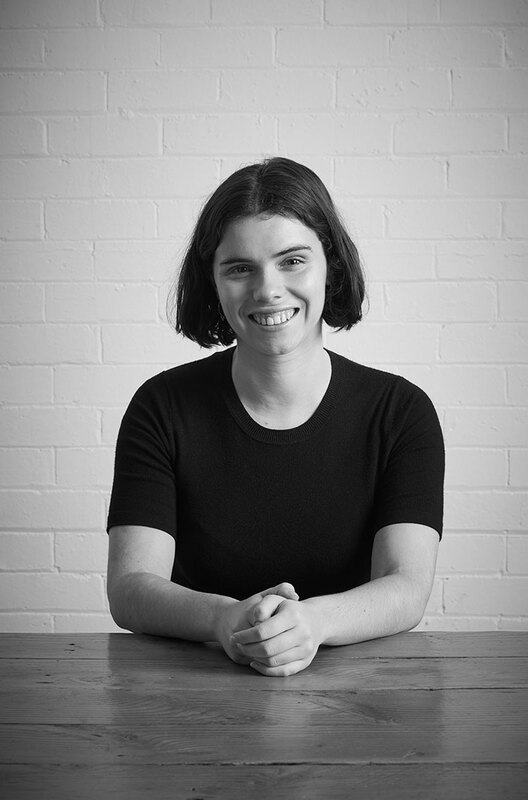 With both a Bachelor of Cultural Studies from the University of Melbourne and a Diploma of Graphic Design, Katie has a keen eye for creative communication and a savvy understanding of the evolving media landscape. As Production Manager, Katie brings her detailed approach and dedication to client service to every project at Grenade.